Sangemini Trevigiani Mg.Kvis Vega Team finished the second collegiate of Latina Scalo, in Lazio, in view of the first official race (Trofeo Laigueglia) of the season. Angelo Baldini’s team worked in the best conditions, the finishing preparation was particularly intense: the riders found an optimal temperature for the period, the Continental group had the chance to ride under the warm sun. Athletes and technical staff are now on their way to reach Veneto where, on Sunday 10th February, the curtain on the Sangemini Trevigiani Mg.Kvis Vega 2019 will officially rise. Starting at 9.45 am at Palazzo dei Trecento, in Piazza Indipendenza, in Treviso we will discover all the details of the continental team in view of the new competitive season. At the beautiful Council Chamber room we will know the riders who this year will bring up the colors of this prestigious company around the world and the training programs. 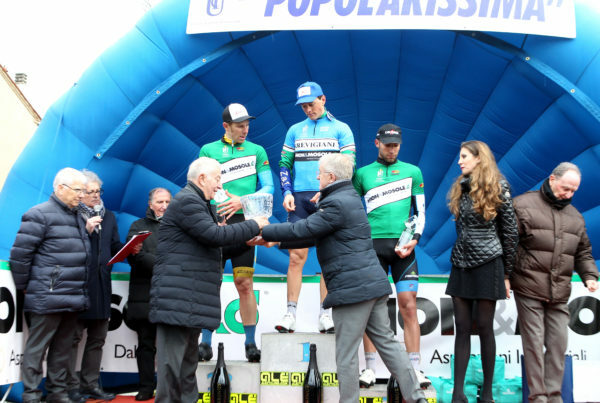 On this occasion the president of the Union cyclists Trevigiani Ettore Renato Barzi will present the 104th Popular, the classic race organized by UC Trevigiani, which this year will be on stage on Sunday 17th March. Absent justified at the ceremony, Michele Scartezzini and Dario Puccioni who from February 12 to 17 will compete with the Italian National Team in Tour of Colombia.